Some came solo. Some came in pairs. Some came to the Bier Baron Tavern in large groups, filling its tables with smiles and laughter and the animated spastic movements of friends old and new, lovers, and coworkers, all just happy to be sharing the same space and each others' company on a late-spring evening. Some came early. Some came late. Some came for the first time. Others for the sixth time this year. But no matter their differences, they all had at least one thing in common -- they would all soon partake in the collective joy of yet another sold-out Perfect Liars Club. Did catering waiter David get trapped in a space-age bathroom at the posh estate of actress Whoopi Goldberg while working her annual holiday party? Did college freshman Sarah succumb to peer pressure and attend a foam party at a dive bar, only to awake the next day covered in a nasty rash? Did Mikael inadvertently teach his 3-year-old daughter and her daycare pal the F-word after reluctantly embracing a new parenting philosophy recommended by his wife? Did dog rescuer Andrea lose her patience with a group of strangers after being asked about her pet's missing leg one-time-too-many? Besides legendary talk show host Phil Donahue, could David name any of the other celebrities who were in attendance at Whoopi's Christmas bash? If the foam party appropriate attire that Sarah and her friends wore to the event was a bit on the skimpy side, where did they keep their IDs and money? Could Mikael explain why he wasn't wearing a wedding ring, if he was -- in fact -- married? Could Andrea identify which of her dog's legs was actually missing? 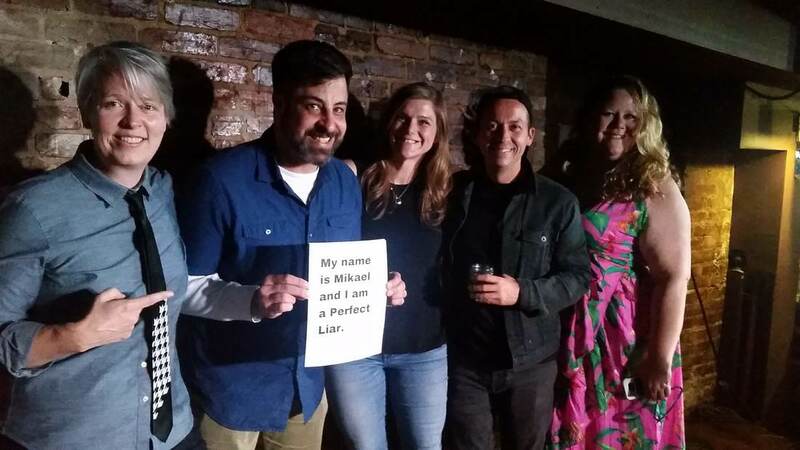 If the audience vote was any indication, it was Ladies' Night at Perfect Liars Club, with Sarah and Andrea sharing the top vote-getter spots, separated by only two votes, at 29 and 27, respectively. But was Sarah's tale of frothy freshman fun and its unfortunate aftermath nothing more than a big bubble waiting to be burst? The drumroll sounded. The audience leaned in. And the night's liar stepped forward, grinning from ear-to-ear. June's teller of tall tales was not Sarah. In fact, it was Mikael. And much like Sarah's freshman year foam party, the shocking revelation had the standing room only crowd in a complete lather.